‘Lushly, transportingly poetic…’ Joy Martin has her heart broken at Luke Wright’s powerful solo performance. Frankie Vah by Luke Wright at Underbelly, as part of the Edinburgh Fringe 2017. Like all of us, I came to Edinburgh to drink from the magic fountain of Art that is the Edinburgh Fringe, but by the end of my second day I was still thirsty. 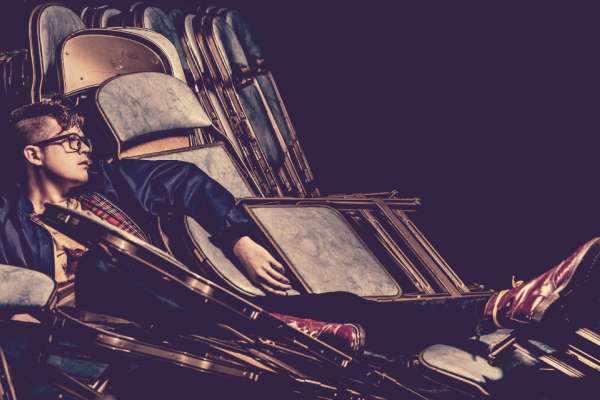 Then, I walked into a small black room at Underbelly for Luke Wright’s new verse play Frankie Vah – a show that lit my heart on fire and gave me a good, long drink of exactly what I was looking for. This is a mature, lyrical and politically relevant piece of poetic writing and, as a one-hour solo show, beautifully performed. Frankie Vah is the performance poet’s second verse play. It is set among the dark, sticky-floored, hash smoke-covered ‘skuzzy indie venues and politics’ of 1980s Britain. Audiences are told the story of a vicar’s son, Simon Mortimer – politicised, disaffected, unhappy – and his transformation into a new self-created identity, Frankie Vah, flame-tongued performance poet extraordinaire, with rolled cuffs, Doc Martens, a platform opening for punk bands and the heady power to influence political debate. His first transformation happens via love, with a woman named Eve. One of the most powerful aspects of this show is the way Frankie and Eve’s love story winds into and around its other narrative threads: the first steps that Frankie and Eve take as young artists; their resistance to Thatcherism in the run-up to the 1987 general election; Frankie’s rebellion against his father’s values and his confrontation with his personal demons and self-destructive behaviour. The personal, political, social and philosophical dimensions of the show spin around each other in a moment of theatre that is lushly, transportingly poetic. It is also delicately nuanced, capturing with sensitivity the moments of tension in Frankie’s life that send his story down increasingly charged pathways, culminating in a finale that broke my heart wider open. the pacing of the unfolding story is effortlessly managed to create a smooth narrative ride, and the skill with which it comes together allows the listening mind the freedom to hear the deeper philosophical resonances of the work: how art dialogues with politics, how the personal dialogues with the political, how we are young, stupid, wonderful and broken, but learning by constantly turning into truer versions of ourselves. I watched and listened in awe and pleasure, just drinking, drinking, drinking in the beauty of this show. Frankie Vah by Luke Wright is on at Underbelly until 27th August. Click here for more details.